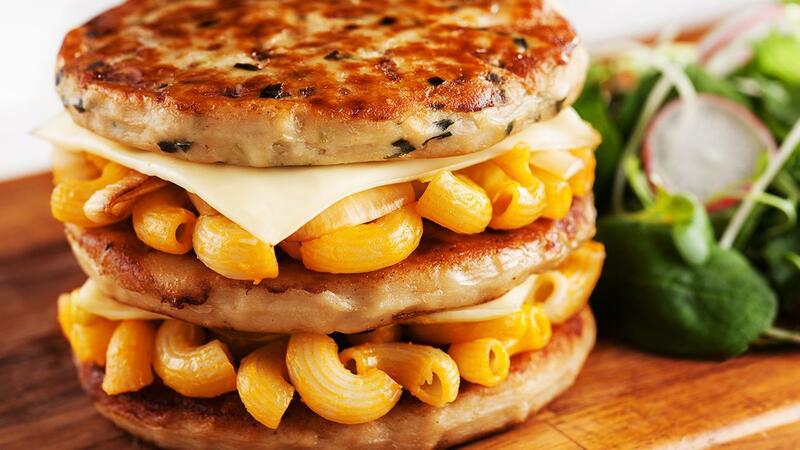 Two American classics converge into one with this unique mac & cheese burger. Stacks of juicy chicken patties oozing with macaroni and cheese sauce give you a burger that is the perfect comfort food. Simmer till sauce thickens up, fold in all cheeses – Grated Cheddar, Parmesan, Munster, Romano – and black peppercorn. Mix macaroni with cheese sauce to form Mac & Cheese filling. Pan fry chicken patties till cooked.